Healthy Living Market is a great place to buy local produce and now they've partnered with a local non-profit organization on an exciting project! SARATOGA, NY (July 26, 2016) -- Healthy Living Market, announced today its partnership with neighboring Saratoga non-profit organization, AIM Services, Inc., on a new summer project, a year in the making, called, “Common Roots Garden”. The new greenhouse and garden is the newest element to be added to AIM Services’ ongoing work-training program. Last Fall, Healthy Living donated $2,000 to its neighbor to build the Common Roots Garden and Greenhouse this past spring. 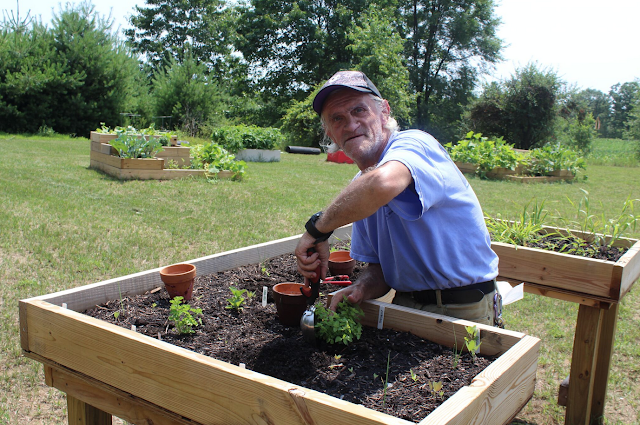 The garden which is located on Homestead Road in Saratoga is now thriving. The project is intended to help contribute to AIM’s ongoing efforts of providing opportunities for individuals with disabilities to participate in an inclusive community project. These individuals receive the support necessary to achieve their personal goals while contributing meaningful work to their community. Common Roots Garden is accessible to everyone on an annual basis from April to October and will help support many of AIM’s ongoing programs. Presently, the garden is an integrated work site with people without disabilities working alongside people with disabilities. AIM is also now selling its harvest to the Saratoga community. All money raised will support the different employment services offered by AIM. Currently, produce is available on location on Saturdays from 9am-12pm. As the garden grows, availability will increase. Visit www.aimservicesinc.org for details. AIM Services, Inc. is dedicated to supporting the "power of potential" in people with disabilities, including those with traumatic brain injuries. Through community and residential programs, advocacy and education, trained dedicated professionals focus on assisting individuals achieve their personal goals while promoting a sense of self-confidence and well-being. Please visit our website to make a donation so that we can continue to provide the best services and care to the families and individuals we serve.